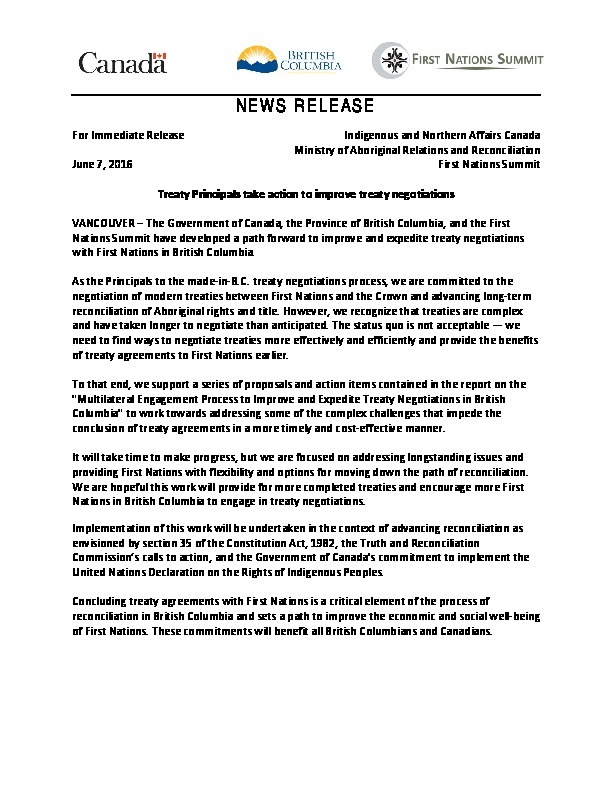 The Government of Canada, the Province of British Columbia, and the First Nations Summit have developed a path forward to improve and expedite treaty negotiations with First Nations in British Columbia. As the Principals to the made‐in‐B.C. treaty negotiations process, we are committed to the negotiation of modern treaties between First Nations and the Crown and advancing long‐term reconciliation of Aboriginal rights and title. However, we recognize that treaties are complex and have taken longer to negotiate than anticipated. The status quo is not acceptable — we need to find ways to negotiate treaties more effectively and efficiently and provide the benefits of treaty agreements to First Nations earlierr.